We even baked brownies for the crew. I decided to take a motorcycle trip to California to join The Movement. How did I hit upon that? It was the day before my first day of Senior Year at college. Me and Giles, my best college buddy, borrowed a friend’s Honda 450 and tripped to Duluth just for the fun of tripping and swimming in Lake Superior. Only I realized while on the trip that this was the last day my life would ever be like this. Every other year of my life I returned to school and knew what I was going to be doing the following Fall – going back to school again. On the trip I realized I would never have another day like this one. It was the last day of the rest of my life as I knew it up to then. Graduating come Spring meant planning for what I wanted to do with the rest of my life rather than just what to do for one summer. The beauty of that insight was that in that instant I realized I was ready to be a college graduate. I couldn’t wait for Senior Year to be over so I could join The Movement for a New America. 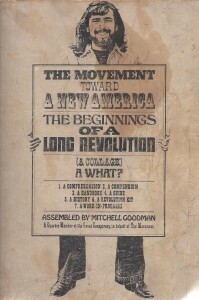 I bought the Mitchell Goodman Compendium: The Movement for a New America. I saved enough money (getting paid to be a Resident Assistant in the Freshmen wing of a dorm, plus weekend midnites mopping-up at a local franchise diner) to buy a Honda 450 motorcycle in the Spring. I could barely wait for Senior Year to be over. And that’s how it should be: Always looking forward to going back to school until Senior Year of college. I read from the Compendium every day and reminisced while looking out my dorm room window at the Commons Area and Student Center. Reminisced about all the great times I’d had at college. More often than not, someone would walk by and bring back a memory – but reading the Compendium I was ready to move on, I was ready to be a graduate. While watching the past walk by, I would start dreaming visions of what could be, what I would do next, highly influenced by the Compendium.